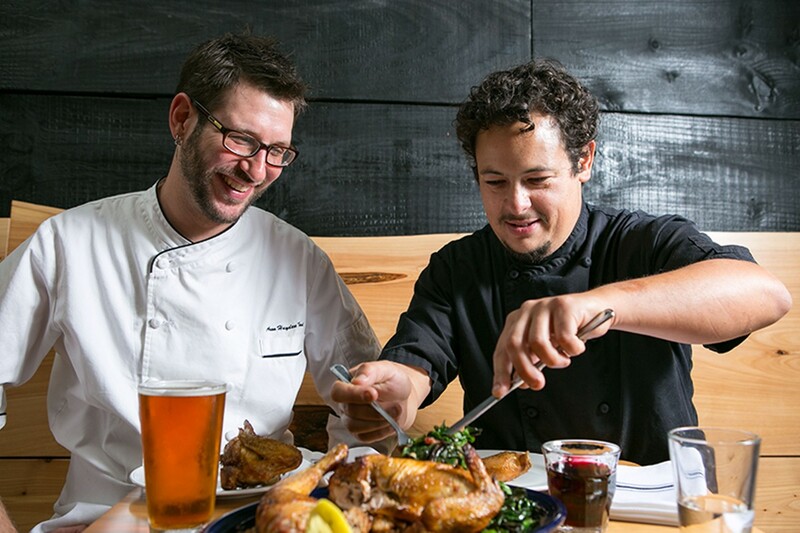 At Nick and Aron's, the oven is the restaurant's culinary jack of all trades. 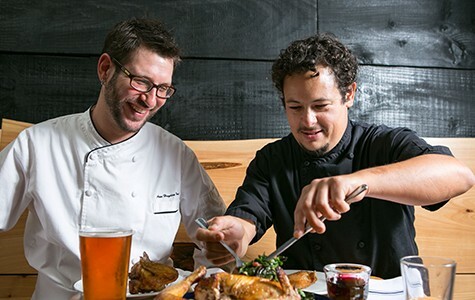 Owners Aron Ford (left) and Nick Yapor-Cox cook dishes that are perfect for family-style dining. Hours: Mon., Wed.–Fri. 7 a.m.–10 p.m.; Tue. 7 a.m.–2 p.m.; Sat.–Sun. 8 a.m.–10 p.m. Anyone familiar with the tight quarters of the typical restaurant kitchen knows that every inch of real estate is precious. At Nick and Aron's, the ovens — a giant, double-decker pizza oven and a full-sized convection oven — take up almost every square foot of the available cooking space. The only other cooking appliance is a small induction burner. "It's pretty much all oven," noted co-owner Nick Yapor-Cox, who is best known as the chef and proprietor of Nick's Pizza in North Oakland. That's what happens when you inherit a space designed to be a bakery, not a restaurant. It wasn't so long ago that the previous tenant, the boutique bakery Barkada, first morphed into a full-fledged bakery-restaurant that served bona fide dinner entrées in addition to cookies and croissants. Nick and Aron's has inherited that mantle — as a working bakery in a neighborhood that could use one, and, more than that, as a restaurant at which the roast chicken platters and robust salads are as big a draw as the various baked goods. Fortunately, if ever there was a culinary duo that was up for the challenge of operating such an oven-centric dining establishment, it's these two. That's because Yapor-Cox and Aron Ford were bakers by trade before they ever thought about running a pizzeria. Both cut their sourdough-fermenting — and pizza-making — teeth at the worker-owned Arizmendi Bakery. Prior to that, Ford — the lead baker at Nick's Pizza — had honed his skills at the Acme Bread Company, and Yapor-Cox started his career as a high-end pastry chef in New York City. That collective pedigree can be seen in the impressive display of breads and pastries that catch your eye as soon as you walk into Nick and Aron's: gorgeous croissants topped with seasonal stone fruit, dense chocolate chip cookies, assorted sweet and savory scones, and hefty rounds of sourdough. When it comes to the food, the secret, it turns out, isn't anything more complicated than to serve the kinds of dishes that achieve their peak deliciousness when they're cooked in an oven. At Nick and Aron's, that means there's a lot of pizza, of course, but it also means one of the best versions of roast chicken I've had in a restaurant recently. 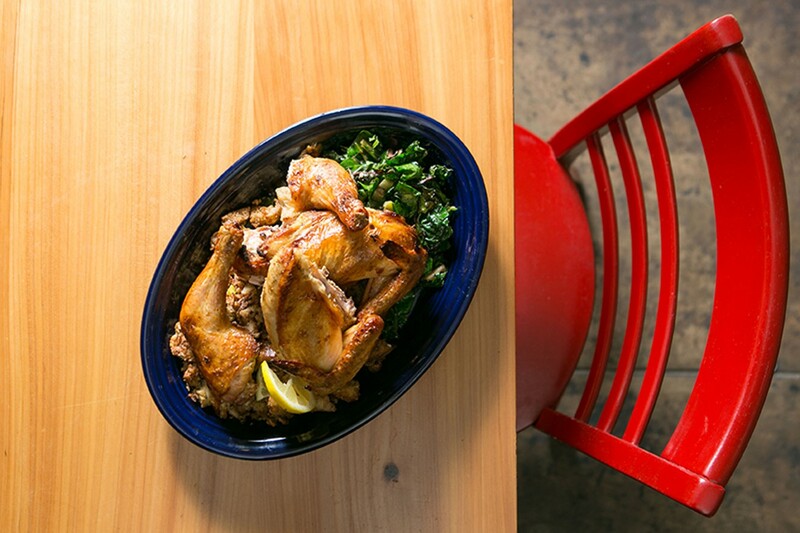 The bird is brined, seasoned simply with salt and herbes de provence, and roasted to order in a very hot oven. (Our server told us about the 35-minute cooking time as soon as we sat down, so we were able to get our order in as soon as possible.) You'll find plenty of more elaborate roast chicken dishes around town, but few that are cooked so perfectly: the skin crisp and impeccably seasoned, the meat slightly pink at the bone so that both the breast and the thigh were tender and juicy. The whole, half, or quarter chicken options all come complete with sides (stuffing and sautéed chard), making this perfect for family-style dining. Ford's walnut-sourdough stuffing recipe, however, was wet and chewy and altogether too wholesome for my taste, which skews more toward crisp edges and copious meat drippings — though, like any stuffing worth its salt, it tasted better as a leftover the next day. But the chicken was a good example of where the kitchen really shines: simple classics done really well — the kinds of dishes you'd find at a low-key French bistro. The restaurant's bowl of mussels, for example, was the best I've had in recent memory. The mussels were taken out of the oven at just the right time to be their juiciest and most plump, and were served in a garlic-and-butter pan sauce that could scarcely be more classic — or more delicious, especially as a vehicle for toasted sourdough. Cooking everything in the oven requires — and perhaps inspires — a certain kind of ingenuity or, at the very least, a flexibility that serves Nick and Aron's well. For instance, the current menu features roasted bone marrow to satisfy a customer's craving for something rich and fatty, given that the restaurant's lack of a deep fryer precludes the typical selection of fried appetizers. And because they can't grill burgers, despite the fact that Ford had developed a recipe for a brioche burger bun, they put a pulled pork sandwich on the menu instead. Nick's Pizza customers will be happy to hear that the pizza is as good as ever. It's what Yapor-Cox calls "Oakland-style" pizza — the dough has a subtle sourdough tang that's rooted in his time at Arizmendi. Because the restaurant is bigger, Nick and Aron's is able to offer more options, both in terms of the size of the pie (at Nick's, there's only one size) and the ability to customize your toppings to a certain extent. There are always about four different pizzas available by the slice, which is nice if you want something to munch on while you're waiting for your chicken to roast. I loved the kale-and-sausage pizza, which boasted a bit of red-chili heat and shreds of kale that had crisped up gloriously in the oven. Breakfast and lunch feature more casual counter service. The roasted corn salad featured sweet early-summer corn, nubs of salty cotija cheese, pumpkin seeds and cucumber slices for added crunch, a spicy-tangy buttermilk-lime dressing, and, as an optional add-on, a generous portion of shredded roast chicken. It was the kind of healthy lunch that made me feel virtuous without feeling like I was denying myself anything. The restaurant recently got its beer and wine permit, and the chefs have started making plans for weekend brunch. At least some of the egg dishes will, of course, be baked in the oven. And while these days everyone's a little sheepish when it comes to artisanal toast (the $4 version, or otherwise), there will, almost certainly, be a few different varieties added to the morning menu. Really, who would you want to serve you fancy toast if not a baker?